I was told by a battery salesperson that a Lithium Ion 100Ah battery is equivalent to a 260Ah lead acid battery bank. Is this correct? I understand that lead acid batteries should only be discharged to 50% so I would have thought that on this basis, Lithium Ion 100Ah would fall short of SLA 260Ah even if the Lithium Ion battery is able to be discharged to 0% SOC. Is the Lithium Ion battery technology more efficient such that Lithium Ion 100Ah is equivalent to SLA 260Ah? Also I have read conflicting views as to how deeply Lithium Ion batteries are able to be discharged. Some literature states that they can be discharged to 20% SOC and other literature states that they can be fully discharged to 0% SOC. Which of these points of view is more accurate? There is a germ of truth in this, though the details will be specific to particular batteries. Li-Ion batteries maintain their capacity fairly well for several hundred charge/discharge cycles, discharging to most of their capacity, provided they are not overcharged, or left discharged for any length of time, or discharged below a certain point. Tesla claim over a thousand cycles I believe, but to what Deplth of Discharge (DOD) I don't know, and they have invested a lot studying cell chemistry and charging. But even "deep cycle" or leisure Lead-Acid batteries don't last very long if you discharge them below 50% of their capacity. (An occasional deeper discharge followed by immediate recharge is probably OK). But if you want hundreds of cycles without much loss of capacity, 50% DOD is pushing it. Call it 40% and that's pretty much in line with your salesperson. The problem with your question is that there's no way to compare apples with apples (unfortunately too few people ever do when it comes to batteries). You also refer to battery "capacity", but your salesman is indirectly accounting for one depth-of-discharge (DoD) for Lead-Acid (e.g. 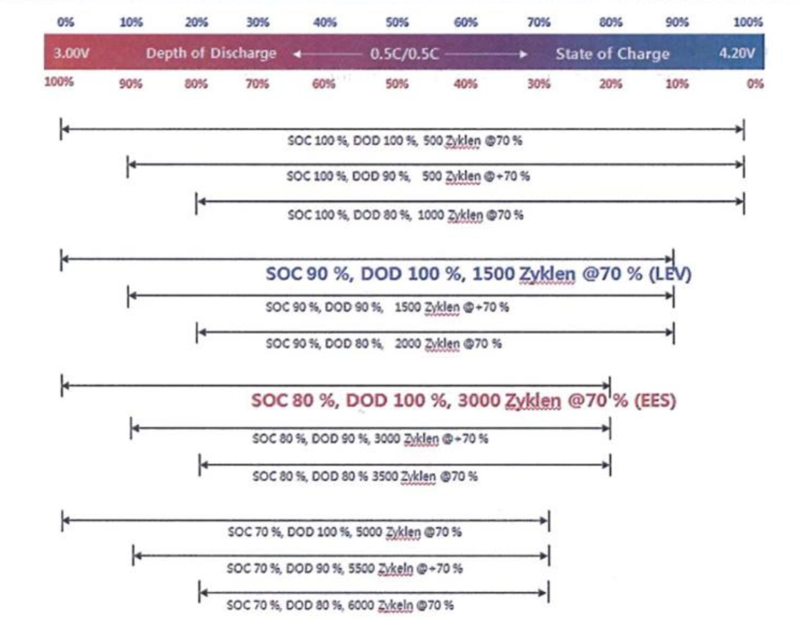 50%) and likely a different and unspecified, but probably deeper, DoD for Lithium, based on some unspecified number of ideal discharge/recharge cycles (1000? 2000? who knows). Hence the usual gaggle of passive-aggressive commenters under your Question. Let's assume you're talking about 'deep cycle' lead-acid (LA) batteries, not engine starter types which WILL degrade VERY quickly with a series of deep discharges. BOTH Lead-Acid and Lithium-Ion/Polymer rechargeable batteries will degrade the fastest by performing 100% discharges. BOTH Lead-Acid and Lithium-Ion/Polymer batteries will last MUCH longer by only partially discharging them. There's a rule-of-thumb in the LA industry that you should not discharge your batteries lower than X%. X% varies depending on who you read/listen to, anything from 25% DoD (i.e. down to 75% charge remaining) to as much as 50% DoD (only 50% charge remaining). That's because it's within the lead-acid battery designer/manufacturer's ability to design a battery, within some economic limits, to achieve Y cycles given X regular DoDs. It's a knob they can turn to change Y. What's more, it's generally OK to do deeper discharges occasionally, if you really need to. It's all about how deep a discharge, how often. The UltraBattery, a hybrid of lead-acid and ultra-capacitor, takes this even further and achieves much more cycles from 50% or deeper DoDs, compared to standard lead-acid. However the UltraBattery technology is not common or cheap, but I mention it to make the point that it is possible. Engine starter batteries take this to the opposite extreme - they'll last for many years being discharged hardly at all; thousands or even tens of thousands of 1% or 5% discharges. The thing to remember is that sulfation on the -ve electrode is an issue with LA used in deeper discharge & partial-state-of-charge (PSOC) applications, which requires them to be periodically 'refreshed' with basically a controlled over-charge, every week or two for daily deep-cycled batteries. This reality means that typical LA applications operate the batteries from 100% full, down to some % DoD; being at/near 100% frequently gives you plenty of opportunities to perform that periodic refresh operation. This is where Lithium Ion/Polymer batteries vary considerably, and are more flexible. Lithium Ion/Polymer batteries will operate in a PSOC almost indefinitely (whether you can track that % SoC accurately is a separate issue). Not only that, but you will get SEVERAL TIMES the discharge/recharge cycle life from them if you do. 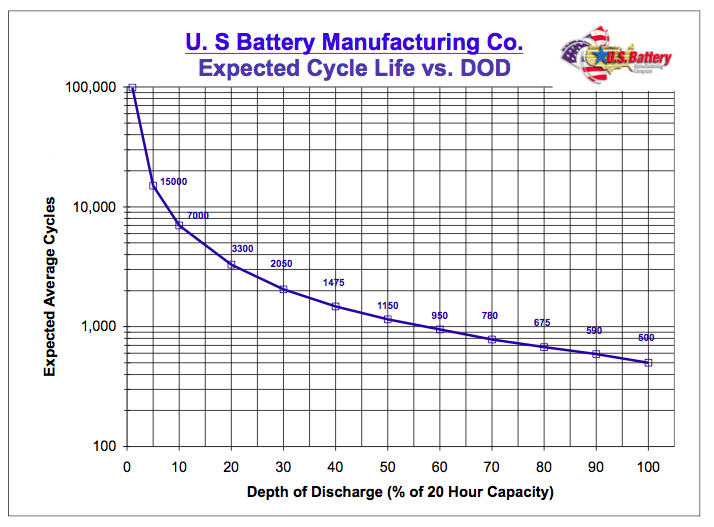 It's the full DoD (down to 0% dead flat) and particularly full recharges to 100% full that cause the greatest cost to Lithium Ion/Polymer's cycle lifespan. Most people don't appreciate just how much difference it makes to the cycle count longevity of Lithium rechargeable to avoid those full charges/discharges. According to this study (I'm trying to find the original source, will link it here if I do) of Samsung 18650 Li-Ion cells: ...if you operate them between 80% and 30% SoC you'll achieve TWELVE TIMES the cycle life (~6000 cycles, before losing 30% charge storage), compared to a mere 500 cycle life if you perform full 100% DoD cycling. If only discharge 80% (down to 20% capacity remaining) you'll still double your cycle life, 1000 instead of 500. If you operate them between 70% full down to 0% full (i.e. never fully charge them up to 100%) you'll get 3000 cycles. This is why Electric Vehicles commonly restrict state-of-charge excursions, by default - so that owners aren't up for $10k for a new battery every few years. By restricting both DoD & SoC, they can multiply the life-cycle count several times (compared to 100% DoDs). It's why, for example, Tesla's, will not recharge to 100% normally, unless you tell it "Hey, we're going on a long trip tomorrow, please recharge up to 100%". Back to your question: Your salesman may indeed have made a fair comparison, but we can't be quantitatively sure without knowing the implied load, and resulting DoD for each battery, & cycle lifetime you're trying to achieve. But it is quite feasible that, if you aim to achieve roughly the same cycle life from each battery, 2 to 3 times the capacity for LA, compared to Li-Ion/Polymer, is a possible outcome. Not the answer you're looking for? Browse other questions tagged batteries battery-charging lithium-ion lead-acid lithium or ask your own question.